From time to time, companies around the globe revisit their strategies on how to use energy and resources efficiently while meeting the corporate bottom line. Mining/minerals-processing industries must pay special attention: An estimated 7% of the electric power produced worldwide is utilized for comminution. Of that amount, only 1 percent of the energy converted by a crusher serves to create new particulate. The issue is compounded by the fact that demand for raw materials is constantly increasing. Academic research is playing an expanded role in that effort. 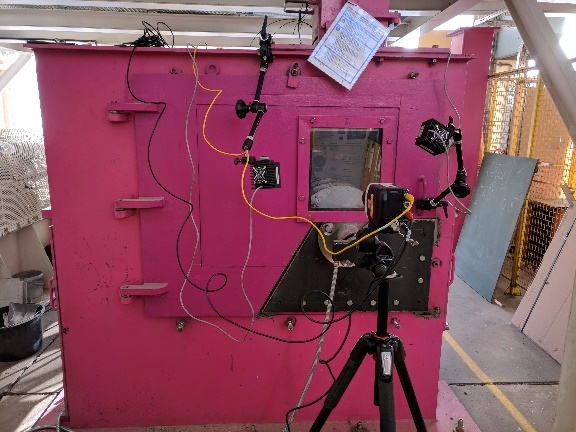 The Institute of Mineral Processing Machines (Institut für Aufbereitungsmaschinen, IAM) at Freiberg Mining Academy and University of Technology (TU Bergakademie Freiberg) in Germany has launched a study to validate an engineering simulation breakage model, comparing its behavior to real-life crushing processes. The experimental crusher visually records a rock’s behavior as it hits a rotating blade, where and how it collides, its resulting particle count and distribution and how much energy is spend on that comminution event; instrumentation measures rotational velocity, including deceleration when the rock hits the blade. The cooperative effort teams IAM with German industry as well as the software developer of Rocky DEM, represented by Engineering Simulation and Scientific Software (ESSS) and its sales/technical partner in Germany, CADFEM. The group chose Rocky DEM for the validation because the software is gaining space in the country’s mining machinery sector, a concept that Bergakademie TU Freiberg – with its strong industry connections – was interested in being part of. 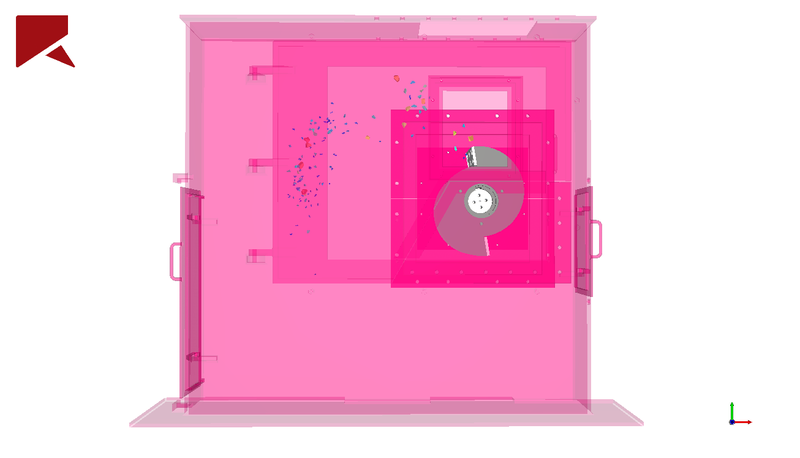 The research team’s impact crusher case involves processing raw materials in a specially built laboratory crusher – outfitted with instrumentation devices, viewing window and high-speed camera capabilities – and then performing Rocky DEM simulation, using the same parameters, to determine if the results are valid. The Rocky DEM breakage model simulation shall computationally predict this same energy transfer and the PSD. Engineering simulation offers the opportunity to glean insights into product and process behavior that experiment alone might not provide. Investigators expect that the validation study based on a mineralogical characterization of the materials can provide more data for the breakage model, which can then be leveraged to analyze comminution equipment and processes. Rocky DEM works with both a fracture subdivision algorithm and a breakage energy probability function, which itself is based upon a well-established model in industry (JKMRC Ab-T10). TU Bergakademie Freiberg for years has been among the top universities focused on resource technologies; it considers itself a partner of industry, working with sectors that are the economy’s backbone. IAM focuses on research related to energy- and resource-efficient machines for economic and sustainable raw-material processing. Ultimately, the impact crusher case results can be used to improve comminution equipment, fine-tuning parameters related to breakage efficiency and throughput. The team expects to publish the results in 2019. 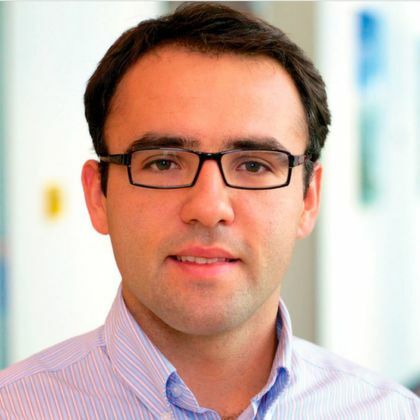 Lucas is since 2009 an application engineer at CADFEM; helping customers to use simulation tools in multiple areas of CAE including CFD and DEM. He has a degree in chemical engineering from the Federal niversity of Santa Catarina-Brazil and master of engineering in applied computational mechanics from the Universities of Applied Sciences of Ingolstadt and Landshut-Germany.